Just how on earth is this planet going to substantially reduce it’s carbon emissions? For sure, it will require radical solutions to be implemented, and a groundbreaking study released this week provides the very roadmap we so desperately need. The report is the first comprehensive analysis of how the global energy system can be restructured based on a detailed assessment for the potential of proven renewable energy sources, energy efficiency and the utilisation of efficient, decentralised cogeneration. Such a route would deliver nearly 70% of global electricity supply and 65% of global heat supply by 2050. 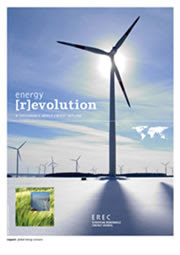 The report, ‘Energy [R]evolution: A Sustainable World Energy Outlook', was developed in conjunction with specialists from the Institute of Technical Thermodynamics at the German Aerospace Centre (DLR) and more than 30 scientists and engineers from universities, institutes and the renewable energy industry around the world. Commissioned by the European Renewable Energy Council (EREC) and Greenpeace International, it demonstrates how we can halve global CO2 emissions by 2050, whilst allowing for increased energy consumption and economic growth. It concludes that renewable energies must represent the backbone of the world’s economy – and that includes developing countries such as China, India and Brazil. Structural change is at the core of the report. Decentralised technologies and energy systems connected to local distribution networks and large scale renewable energy supplies, such as large offshore wind farms and Concentrating Solar Power plants will be key components. This will achieve higher fuel efficiencies and reduce distribution losses. In stark contrast, following a "business as usual" scenario would see demand for energy double by 2050, the authors warn. The report also highlights the short time window for making the key decisions in energy infrastructure. Within the next few years governments, investment institutions and utility companies have to act. Within the next decade, many of the existing power plants in the OECD countries will come to the end of their technical lifetime and will need to be replaced, whilst developing countries such as China, India and Brazil are rapidly building up new energy infrastructure to service their growing economies. This is a rallying call for governments to phase-out subsidies for fossil and nuclear fuels by 2010 and introduce the `polluter-pays principle`. The market as it currently exists is distorted by the fact that it is still virtually free for fossil and nuclear fuel industry to pollute. Current conventional energy subsidies (to the tune of $250-300 billion worldwide) artificially reduce the price of power, keep renewable energy out of the market place and prop up non-competitive technologies and fuels. Thus, at present new renewable energy generators have to compete with old nuclear and fossil fuelled power stations which produce electricity at marginal costs. Without political support renewable energy remains at a disadvantage, marginalised by the distortions in the world’s electricity markets created by decades of massive financial, political and structural support to conventional technologies. Developing renewables will therefore require strong political and economic efforts, especially through laws that guarantee stable ‘feed-in’ tariffs over a period of up to 20 years. This is a way to expedite our energy independence and economic growth. (This will also create a substantial amount of new jobs). It will take maximum effort and a relentless pursuit of the private, commercial and industrial government sectors commitment to renewable energy – energy generation (wind, solar, hydro, biofuels, geothermal, energy storage (fuel cells, advance batteries), energy infrastructure (management, transmission) and energy efficiency (lighting, sensors, automation, conservation) (rainwater harvesting, water conservation) (energy and natural resources conservation) in order to achieve our energy independence. Yes, this is an excellent report showing how we can decarbonise the world's economy. There summaries and links to other reports on the same theme (and also the costs of *not* taking action) at http://www.mng.org.uk/green_house/scenarios.htm . 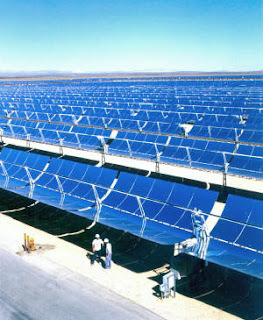 And there is more information about concentrating solar power at http://www.trecers.net/index.html and at http://www.trec-uk.org.uk/index.htm . In my opinion in reality, solar power may not provide enough energy for ALL of our energy needs. But it could provide be a large percentage energy source. Coupled with nuclear power, wind power and water power, we could stop global warming. And getting solar power requires more studies, solar power has big potential, because Solar power is essentially infinite, so it never runs out, unlike fossil fuels. The amount of solar energy intercepted by the Earth every minute is greater than the amount of energy the world uses in fossil fuels each year. Hi Solarpower - as you rightly state, solar power is essentially an infinite energy resource. Each year, each square kilometer of hot desert receives solar energy equivalent to 1.5 million barrels of oil. Globally, this adds up to nearly 1000 times the current energy consumption of the world. So, on your very own reasoning, there is no reason why solar power (alongside other clean renewable technologies) cannot provide enough energy for our needs and that of burgeoning future generations - without the need to resort to dirty, dangerous, unsustainable and finite resources such as nuclear.